Well When Lynda chapman was on Create & Craft with Pollyanna Pickering and I saw the artwork I just had to order it. The 1st card I made was a 7x10 inch card and I used black card to mat and layer with. I used the backing paper, image & tea bag tiles from the cd rom. I was pleased with the out come of the teabag folding as I have not done it for a while. I added black ribbon, and turquoise pearls. 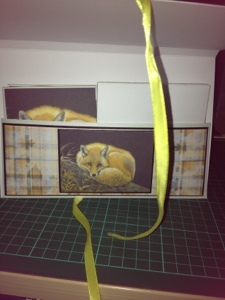 The 2nd one I have made was a stationary set which had notelets and envelopes which were on the cd rom. 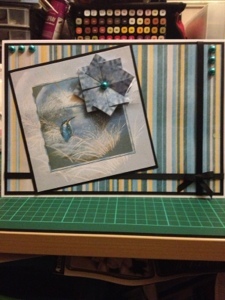 I used black card for mat and layering. I think Lynda Chapman has influenced me on the black card. I used the teabag topper from the cd rom and the teabag tiles, and the backing paper is from the cd as well. I also used yellow ribbon and black gemstones to bling it up. 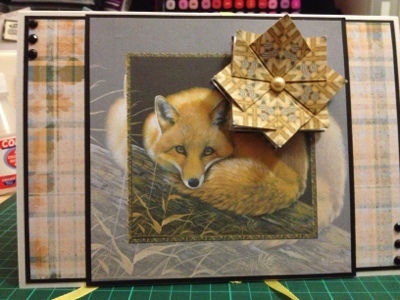 Fabulous animal images, great card and stationery set. Gorgeous makes Sam - I got this cd too - just couldn't resist the images! These are gorgeous Sam! Love the one with the fox the image is fabulous!